Opara Law PC represents victims who have suffered injuries to the head and to the back. These types of injuries can arise from car accidents, violence, and sports related injuries. We at Opara Law PC will fight tirelessly to get the compensation you deserve. Generally there are two types of Traumatic Brain Injuries (TBI). Open and Closed. Both types can cause complete paralysis and even death. An open Injury consists of the skull being fractured and is usually caused by a significant blow to the head. A closed injury does not have a fracture in the skull, however at times this may be the more serious injury because there might be some swelling in the brain. Also, with a closed injury there may be blood clots or other serious unforeseen complications. 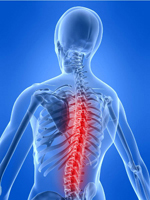 Spinal cord injuries along with neck injuries are very serious. This type of injury can cause paraplegia or quadriplegia depending on the location and extent of the impact. In a majority of cases these injuries become debilitating and irreversible. Opara law PC will work meticulously and diligently to determine the extent of the injury and will determine what potential consequences it will have on your future. We will work hard to get you the best outcome possible.